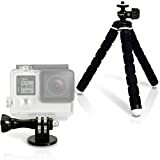 iGadgitz Small mini tripod with 1/4 inch screw thread and mount for attaching GoPro Hero5 Black, Hero5 Session, Hero4, Hero3+, Hero3, Hero2, Hero1, Hero Session action video cameras. Can also be used as a tripod for compact cameras and mount compatible with monopods, selfie sticks. The iGadgitz small flexible mini tripod lets you position your Go Pro almost anywhere to help you capture the perfect shot. Completely flexible and versatile, attaching the mount to your camera and the tripod is simple, and you can be ready to shoot a movie in seconds. Rubber feet grips provide enhanced stability on uneven surfaces. The tripod fits easily in your camera bag without adding noticeable weight – it weighs just 68g with height of 17.5cm only. Also use the tripod for other digital cameras using the 1/4 inch screw thread, up to a maximum of 275g. The mount is compatible with other accessories like selfie sticks and monopods with 1/4″ screw threads. This entry was posted in Discount Photography and tagged Adaptor, Black, Flexible, Foam, GoPro, Hero, Hero1, Hero2, Hero3+, Hero4, Hero5, iGadgitz, Lightweight, Mini, Mount, Screw, Session, Small, Thumb, Tripod, Universal by Ball Photo. Bookmark the permalink.